Yet another all-in-one? Don’t worry, they aren’t all made equal. While I can’t say that the Aspire Nautilus Ultra Portable System that I recently reviewed was mind-blowingly good, I can say that Aspire developed a quality pen style vape, the Aspire Tigon Kit. All-in-One kits just seem to be a hit or another cookie-cutter attempt at making vaping easily accessible to beginners and MTL vapers. However, I was pleasantly surprised by the performance of the Aspire Breeze 2 All-in-One Kit, especially at the current market price. This one is worth checking out. The Aspire Breeze 2 All-in-One Kit’s design is pretty ordinary. There isn’t anything flashy. Any differences in this kit compared to other all-in-ones lie in the separate elements of the device. Although many all-in-ones, pod mods, and ultra portable systems often keep it simple with just two elements, the Aspire Breeze 2 All-in-One Kit consists of the mod (where the battery is housed), the pod, the coils, the removable top cap and mouth piece, and the air flow control. Otherwise, the device looks similar to many other MTL kits like this. It’s small and compact, and has rounded edges to make it more comfortable to use. The colors available are black, blue, red, and gunmetal. The body of the mod has a zinc alloy chassis, both durable and nice to look at, especially with the matte-like, satin finish. There are three buttons on the Aspire Breeze 2 All-in-One Kit: one firing button on the front face of the mod and two pod release buttons on the side. Although this kit isn’t quite as simple as the charge, fill, and go kits, it’s essentially the same business. To get going, charge the device, remove the protective top cap/mouthpiece, take out the airflow control, and then pop the pod out. To fill it, locate the silicone plug on the bottom, pull it up, and fill it up with the e-liquid of your choice. Please note, though, that this kit works best with higher concentration juices, and though you may use a lower concentration, you probably won’t enjoy the experience as much. As with most devices, it’s five clicks of the firing button to turn it on and off. Aspire took note that the original Breeze pods weren’t very easy to see through. They fixed it with the Breeze 2. Although the polycarbonate material is a darker gray, it’s still easy to see your liquid level. These pods also have a 3ml juice capacity, so you shouldn’t need to refill this MTL kit as often. The Aspire Breeze 2 All-in-One Kit uses the Breeze U-Tech coil system. In the kit, you’ll get both the 0.6-ohm coil and the 1.0-ohm coil. Although these are both good quality coils, the 1.0-ohm coil works better for a true MTL vape experience. The life of these coils is about two weeks and the flavor is strong throughout. These are excellent flavor coils, especially with highly concentrated liquids. One of the things I most liked about my experience with this kit was the adjustable airflow. It’s a bit of a pain to get the top cap off at first, but from thereon it’s easier to remove. Once you access the airflow, you can adjust it by moving the knurled edges. There are five holes, giving you plenty of room to find your perfect amount of airflow. As far as ease of use, the Aspire Breeze 2 All-in-One Kit was nearly painless. There was no leaking, little to no spitback, and the coils delivered a good balance of flavor. I vaped this kit with Nectarberry by Superb Salt Liquid.The throat hit from both U-Tech coils was more than satisfactory and they handle salt-based juices beautifully. While the 0.6-ohm coil did well as a MTL, at times, it felt more like a restricted DTL experience, so I really think this coil can handle either. The battery life was excellent, lasting a full day and then some with moderate usage. The Aspire Breeze 2 All-in-One Kit is, in my opinion, a little step up from some other pod-type devices that don’t use separate coils. Since a lot of pods have them built into the cartridge itself, it doesn’t give you the same amount of flexibility or control. While I wouldn’t say that many all-in-ones are the only way to go (I still prefer sub-ohm vaping, myself) this is a great option for beginners who want an all-in-one system that performs well, delivers good flavor, and allows for adjustable airflow. This is another great option for those of you MTL vapers who want something portable, reliable, and a device that gives an all-around good vape. 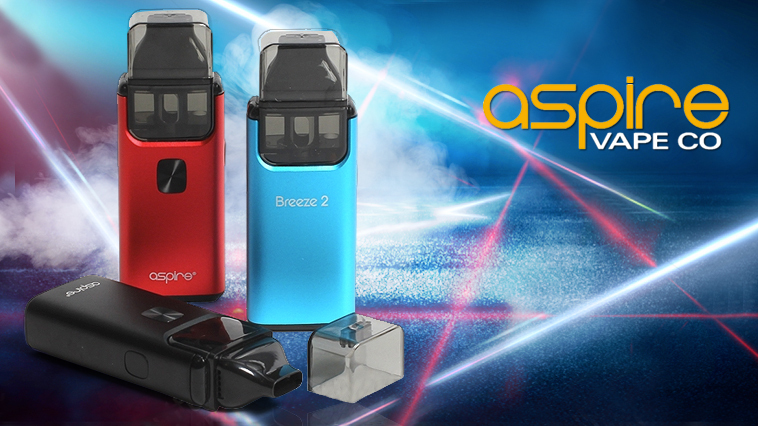 Purchase the Aspire Breeze 2 All-in-One Kit here. Still looking? Read more hardware reviews on Soupwire to find your perfect match.